Cheddar’s Casual Cafe is a wonderful restaurant. It does a good job of combining a moderate price and a delicious menu that everyone will love. One of my favorite appetizers there is the Santa Fe Dip. Now you can recreate this recipe at home with this easy copycat recipe. Cheddar’s is a great value for the price. Menu items here range from chicken tenders, grilled chicken, and even steak. They have an extensive bar menu that will please any cocktail, lovers. They have a wide range of appetizers; the Santa Fe Dip features spinach, a four cheese blend that is irresistible. Best of all, this is an easy recipe to prepare. You will fall in love with this one. It is hard to resist this dip. It is served with cool and refreshing sour cream and salsa. If you like artichoke and spinach dip, this will be an appetizer you will love. This can be easily prepared ahead of time and reheated when you have a party or special gathering. I like this dip because it isn’t too spicy, and it is perfect for a dip. They serve this dip with warmed tortilla chips. You could also serve this dip with carrot sticks and celery sticks. 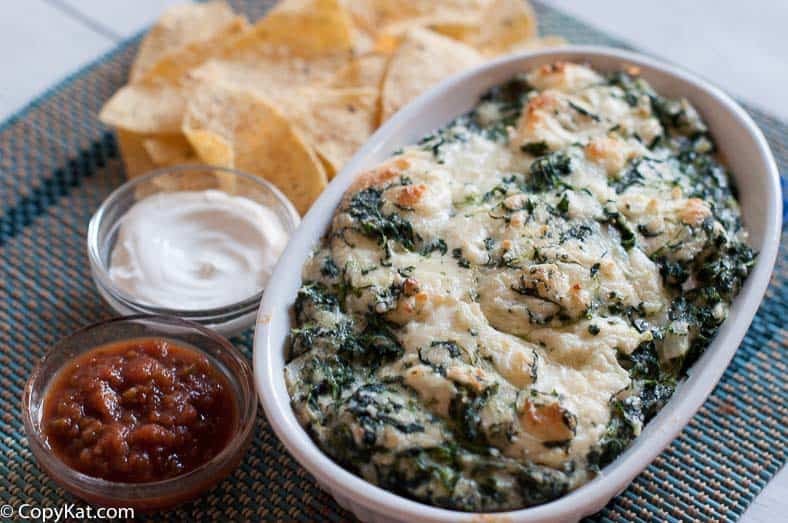 You might wonder what makes this recipe so special, this creamy spinach dip is perfectly seasoned with onions, garlic, and a tiny bit of jalapeno pepper for a hint of spice. The four cheese blend adds the perfect amount of cheese flavor to go with this dip. This spinach dip is served with refreshing sour cream and salsa. I hope you enjoy this easy to prepare recipe. If you enjoy this dip, you may like some of these appetizers. 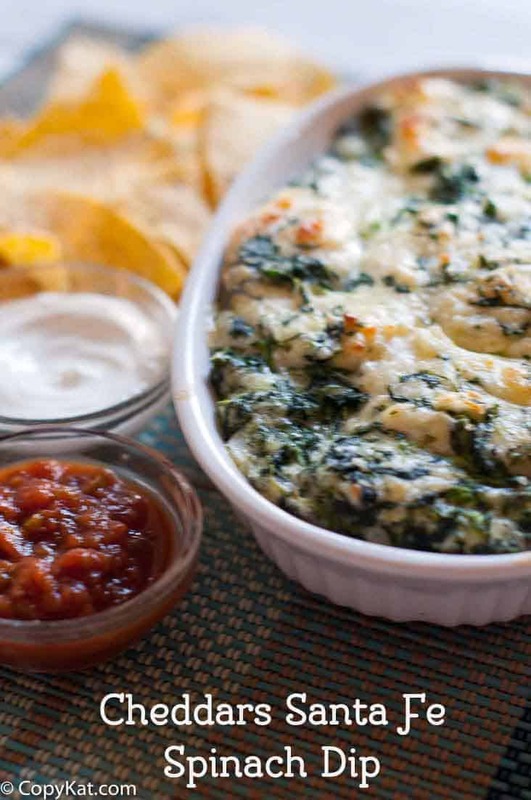 You won't want to miss this recreation of Cheddars Sante Fe Spinach Dip. Preheat the oven to 350 degrees. In a medium bowl, combine the spinach, onions, cream cheese, Cheddar cheese, Monterey Jack cheese, mozzarella cheese, garlic, jalapeno pepper, and seasoned salt. Stir until well blended. Spread into a 1-quart casserole dish and bake for approximately 30 minutes or until the top is nice and bubbly. Serve with sour cream, salsa, and warmed tortilla chips. Cant wait to try this recipe… could you do please work on the barbecue sauce for Cheddar’s baby back ribs honey barbecue sauce? Thanks !! Sorry. Add some Monterey Jack to the mixture also. Cheedar’s uses Alfredo sauce as the base. Thaw and squeeze the spinach dry, then chop it again to reduce chip breakage when dipping. Alfredo sauce, Parmesan, salsa, white pepper, salt. Add the spinach after the sauce has cooled. This helps the spinach maintain it’s color. Place 1 cup of the spinach mixture in an au gratin dish and top with 1 ounce of Monterey Jack cheese, wrap with plastic wrap and refrigerate. Microwave for 1 1/2 minutes covered with the plastic wrap. Top with 3/4 ounces sour cream and garnish w/ 3 chips inserted upright in the sour cream. Served with salsa on the side. These steps you’ve listed, are these all of the ingredients that go into Cheddar’s spinach dip? And if so, how much of each ingredient would you guess? I keep searching for a good copycat recipe but I know none of them are going to be exact since everyone’s been playing the guessing game when attempting to make this dish. All of the comments I’ve read on almost every single recipe have said it doesn’t taste like Cheddar’s but that it’s good and worth making again. That’s not what I want. I want Cheddar’s, and I want to be able to make the dip myself in my own home without having to go out anywhere! Any extra advice/details on this dish you have would be much appreciated! P.S. – I just saw a video/interview with an employee from Cheddar’s and he listed some of the other ingredients in the spinach dip: cream cheese, Asiago cheese, Parmesan cheese, mozzarella. I made this for a party, and everyone loved the dip! Why, oh WHY are so many comments based on the PHOTO?!?!?!?!?!? Thank you to all who follow the recipe and comment ON THE RECIPE!!!!!!!! Who cares how you think it looks?!?!?!? Are the reds RED??? Oh look what a pretty table cloth!!! WHY???????? Tried it. Very nice. I later sub’d cheddar for 1/4 cup Parmesan to cut back a little on oil and stays softer longer while hot. Add 1/2 tsp. basil and serve with a good bruschetta mix and toasted loaf bread sliced thin instead of salsa/sour cream/chips for a perfect Italian twist. A chilled sweet or semi-sweet wine (regardless red or white) goes well with this appetizer. I tried this and was not a fan…it looks good but tasted nothing like Cheddars (which is my favorite)..Maybe I did something wrong…the only thing I did not add was the onion….Sorry….